Economists are debating whether this current recession is deepening to become the great Depression of the 21st Century. I suppose economists do not know that just as the Depression of the 1930's was planned by the usury bankers, so is this 12stCentury Depression being planned by the same usury bankers. Popular polls indicate a steady sagging of public confidence in our orthodox, economic system of usury-based, debt money. Perhaps some perspective of the design flaw of usury is in order. The fact of the matter is that we-the-people in Canada, the United States, and in the entire world, have been victims of lies, deceit and deception in regards to how, when, where and why the debt-money portion of any loan or mortgage is created by the creditor (based on the signature of the debtor on a promissory note) while the usury or interest portion of any loan or mortgage is never created and put into circulation by the creditor. Neither is the usury or interest on any credit card ever created and put into circulation by the issuer of the credit card - the creditor. During the 20th Century, much wealth and prosperity was stolen by creditors from debtors than ever before in recorded history. Unfortunately, as John "The Engineer" Turmel says this is "the biggest lie never exposed." It is time now to expose the big lie of usury, and to promote/advocate the usuryfree, community currency movement as the catalyst that will usher in the new age of usuryfree living for everyone on planet earth. Since the early 1980s, we have been experiencing the birthing of the usuryfree, community currency movement as the optimal strategy to implement that will free us from the ugly iron grip of usury which has been shackling debtors for generation after generation. Michael Linton with financial support from John "The Engineer" Turmel launched the usuryfree LETS (Local Employment Trading System) software program in the deep recession of the early 1980s when interest or usury rates spiked a 21% in Canada. Since that time the usuryfree, community currency movement has been evolving and expanding at a steady rate. As this current recession deepens to become the grand-daddy Depression of recorded history, the usuryfree community currency movement is fast gaining popularity as the "economic lifeboat" of choice. While "the biggest lie never exposed" is the incredible, economic story of the 20th Century, the "greatest opportunity not yet understood" has the potential to become an even greater economic story of this 21st Century. Indeed, it is working models from the usuryfree, community currency movement that offer the greatest opportunity not yet understood to individuals, families, small-to-medium-sized businesses and governments (local, provincial/state, and federal) as well as countries. Peace, abundance and prosperity for everyone on planet earth will be possible when the design flaw of usury is abolished forever from our orthodox, economic system of debt-money. This will be possible because eventually usury will be replaced with a simple service charge (fee) which can be created and put into circulation simultaneously when any loan or mortgage is issued by any creditor. In light of this new experience of financial freedom which leads to the reality of usuryfree living, it is now exciting to become a usuryfree creative and actively participate within the usuryfree, community currency movement. The answers to these questions are still unknown, but the expectation is that debtors (and there are many more debtors than creditors) will be highly motivated by their new knowledge that exposes the design flaw of usury for the big lie that it is. The creditors may very well realize the need to take action to shift the economic paradigm if they wish to remain as significant players in future games of co-operative finance where there will be mutual benefit for all who choose to participate as creditors and debtors. As one who has been proclaiming the benefits of usuryfree living for 30+ years, I'll admit it is becoming easier to explain to audiences why their stock portfolios are diminishing while "the biggest lie never exposed" is finally exposing that the creditor has no credibility as the emperor has no clothes. As we progress into this 21st Century, we can expect the number of committed, usuryfree creatives to expand exponentially. With newly acquired knowledge they will assume their moral obligations to present the truth about modern money creation as it has been hijacked by the usury bankers. Then they will explain what economic freedom will become when the design flaw of usury is taken out of the equation. I leave debtors with this small but powerful quote that proves usury contracts are impossible to be fulfilled. The quote is taken from the Introduction of the book War Cycles, Peace Cycles authored by Richard Kelly Hoskins. "If there is only $10.00 in existence, and you lend it to someone under the condition that he repay $11.00, and if he agrees to this, he has agreed to the impossible." From this simple quote it is easy to understand that if the debtor borrows $10.00 and is forced to pay back $11.00 (at a usury rate of 10%), then sooner or later the creditor (the usurer) will steal the debtors property. Debtors are encouraged to join a usuryfree community currency group in your local area OR otherwise take a leadership role and launch a usuryfree community currency to encourage consumers to shop locally. DO IT NOW! Usury is the original sin of the world's monetary and economic systems. Contracts based on any interest/usury are NULL AND VOID. 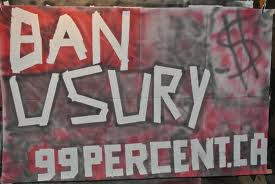 It's time for a universal debt Jubilee so that the People have abundance in 2012! Why I Avoid Using A Microwave !! Lets Celebrate UsuryFree Living Now and Beyond! !